Stephon Marbury, the wildly talented and widely criticized point guard for the New York Knicks, usually carries a Q rating commensurate with Kim Jong Il. Making max dollars and being the face of the NBA's most dysfunctional franchise will do that. But Marbury has been drawing high-profile praise in recent days for promoting a new basketball sneaker described as "revolutionary." What's "revolutionary" about the new Starbury One — a reference to Marbury's on-court moniker —is that it doesn't cost as much as a plane ticket to Maui. The Starbury Ones are listed at $14.98.That's $14.98. Not $149.80. As William Rhoden recently wrote in the New York Times, "This is an industry in which star athletes encourage children to buy shoes for anywhere from $75 to $200." The shoe is not cardboard and canvas but serious and solid enough that Marbury has pledged to wear them in games this season. He says his motivation was rooted in discussions he had with Knicks GM Isaiah Thomas about the civil rights movement and Marbury's eventual legacy. "[Thomas] was explaining to me how my generation never went through anything," Marbury told Rhoden. "There was a generation that went through things that we never even envisioned. For me to be able to talk with him, get insight on how things were back in the day, I got a picture of what he created for me to see. It made me feel like I want to put my mark on history as far as letting people know that I'm a part of something that I'm moving with. All this is brand new, this is revolutionary, the thing that we're doing right now." In tune with the idea of a sneaker for social justice, Marbury's website urges visitors to "join the movement," and the chic insignia, familiar to those with a fascination for Che Guevara, is a stylized red star. Marbury isn't all talk. He has a history of putting his money where his heart is. He pledged about $500,000 last year to help victims of Hurricane Katrina and then wept at a press conference. "It's not even about money," he said. "Now, it's more about everybody coming together and just trying to live as one.... I keep looking at my kids. You don't think about anything else, you just hold them so tight. They don't even know why you're looking at them like that. You want to cry in front of them, but they don't understand." The Starbury One sneaker is being produced and retailed by Steve and Barry's University Sportswear — and they are flying out of the stores as quickly as they are being made. As Howard Schacter from Steve and Barry's told me, "The vision we shared with Stephon was to eliminate the incredible pressure kids and parents feel to pay top dollar for the latest and coolest sneakers and clothes. What we're saying is, You can pay a lot less for these things.... That message has definitely sparked a movement in this country, as consumers' eyes have been opened to the fact that it simply doesn't cost that much to make high-quality sneakers and clothes." But the Starbury One — because of both its price and the fact that it is being marketed as footwear for social justice — has also invited scrutiny. The athletic shoe industry is notorious for some of the most appalling of sweatshop conditions. 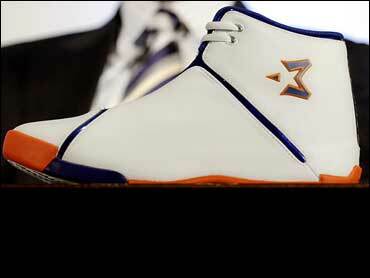 Are the Starbury Ones, made in China, produced in such a manner? Schacter says no. "We are a member of the Fair Labor Association," he says. "More importantly, firmly embedded in our history and culture is a deep commitment to legal compliance and ethical business practices. This commitment is a fundamental part of the philosophy upon which we were founded." Schacter says that costs are kept low because their business model "eliminates the middleman" by producing their own product and selling them in Steve and Barry's stores. They also rely on word-of-mouth instead of national advertising campaigns. But some leading anti-sweatshop activists doubt this claim precisely because the shoe is manufactured in China. Jim Keady is a former professional soccer player and coach at St. John's University who is now co-director of the anti-sweatshop organization Educating for Justice. He is also a member of the City Council in Asbury Park, New Jersey. "One of the key ways to define a sweatshop is whether workers have the right to develop an independent, democratic voice in the workplace either by creating a worker-owned cooperative or an independent trade union," he said to me. "In China both cooperatives and independent trade unions are illegal, and therefore I would bet my professional reputation that these shoes are produced in sweatshop conditions. That said, Asbury Park has a poverty rate of 30 percent. I see kids buying sneakers I know they can't afford, so it is a good thing an affordable sneaker is available." Scott Nova, from the Worker Rights Consortium, an anti-sweatshop monitoring group, also disagreed with Schacter's confidence in Steve and Barry's labor practices. "We have found serious human rights violations in factories producing for Steve and Barry's," he told me. "The company's response has been a mixed bag. In one case, the company did take action and progress was achieved. In another, we reported serious violations, including sexual abuse of women workers by managers. Steve and Barry's response was slow and ineffective. "It is laudable that Steve and Barry's is offering affordable sneakers," Nova continued. "But there is another side to the moral equation: the workers who make the shoes. What are they paid? And what are their conditions of work? Ignoring worker rights could transform a worthy endeavor into another case of sweatshop exploitation. If the low price of these shoes means sweatshop conditions and sub-poverty wages for the workers who make them, then the positive purpose of the enterprise is severely undermined. Stephon Marbury is obviously trying to do something positive and deserves to be applauded for it. Addressing the worker rights issues will enhance his effort." I was unable to reach Marbury for this piece, but it's difficult to imagine him being unsympathetic to the plight of workers overseas. He has spoken out about selling sodas on the beaches of Coney Island as a young boy, trudging on the sand and trying to scrape a dollar or two from the tourists visiting the famed amusement park. It was a childhood that would be familiar to many children in the "market-Stalinism" world of China, where kids rush tourists offering cheap goods, attempting to get a crumb or two off the table. As Jim Keady said, "The real slam-dunk would be if Stephon Marbury came forward and said, 'Not only do I want poor kids to be able to afford my sneakers. I want their moms and dads to have good-paying factory jobs — in Coney Island, Bed-Stuy or Asbury Park for that matter. Imagine that: a sneaker made for the players in Brooklyn by the people in Brooklyn, he said. "Would they be able to sell them for $14.98? Maybe not, but that would be a tremendous model that other athletes and other entrepreneurs could follow." Dave Zirin is the author of "What's My Name, Fool? : Sports and Resistance in the United States" (Haymarket).